A book review of ?Changing Jobs. The Fair Go in the Machine Age? by Jim Chalmers and Mike Quigley, Redback 13, Schwarz Publishing, September 2017, paperback 208 pp., RRP $22.99. ?Changing Jobs? is a long-form essay, with each of its seven chapters designed to stimulate attention. It tackles a very important policy topic: the need to prepare Australians ?for a future in which many routine jobs, both manual and cognitive, will be done by machines?. It aims to provoke, and it will succeed in that. It is a timely book, and deserves wide reading by policy wonks ? and I use that term with affection. But the book also merits some criticism for its limited vision of the future of work ? a perspective which might surprise the authors, whose clear intention is to jolt many decision makers out of their current complacency. The two co-authors lend considerable credibility to their essay from the start, being distinguished in their different fields of expertise. Mike Quigley is one of the most highly respected telecommunication engineers in Australia. His outstanding achievements, particularly in building the National Broadband Network from scratch in its first four years 2009-13, were recognised by TelSoc awarding him the Charles Todd Medal in 2013. Dr Jim Chalmers is currently federal Shadow Minister for Finance, a political scientist turned politician, and a former chief of staff from 2010 to 2013 to Mr Wayne Swan when Federal Treasurer. Dr Chalmers has earned a fine reputation (as have his colleagues Dr Andrew Leigh, Tim Watts, Clare O?Neill and Mark Butler) for their writings on serious policy development that look well beyond winning the next election. Changing Jobs is part literature review and part analysis, leading to a set of useful recommendations, as one would hope. The authors make it engaging by starting the introductory Chapter 1 with an anecdote about Mr Quigley?s use of the Duolingo app for learning foreign languages. And Chapter 6 (?What governments should do?) relates the heart-wrenching story of the 16-hour working day endured by the six-year-old Elizabeth Bentley in 1815, as reported to a UK parliamentary inquiry ? to show us how far working conditions have improved in Western countries over the past 200 years. Similarly, Chapter 7 (?What each of us can do?) 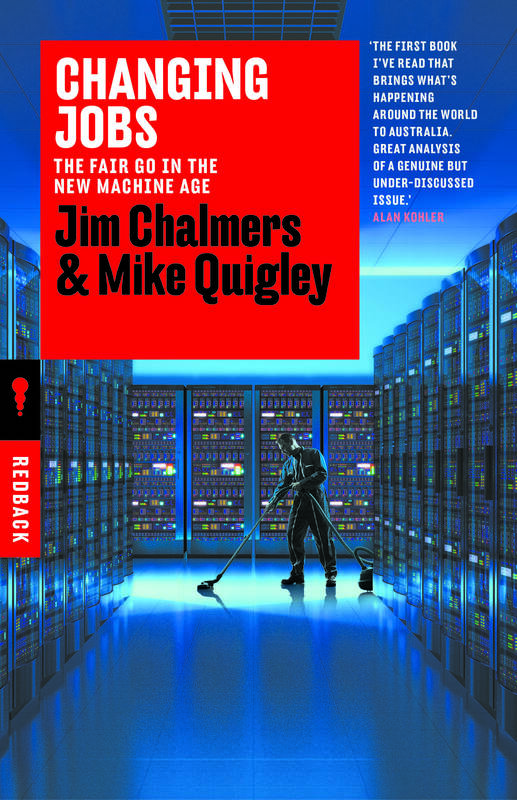 begins with Mr Quigley drawing upon his career experience in technology transfer working in China some decades ago, with his wistful reflections on how that helped transform China into the West?s greatest commercial competitor. Chapters 1 and 2 serve to create awareness of how serious the impact of Artificial Intelligence (AI) will have on our society, presented within the usual historical perspective of human evolution via the Agricultural, Scientific, and Industrial Revolutions to the current Digital Revolution. In fact, one of the book?s finest features is its explanation of AI for a lay readership (pp.42 to 52). Chapter 3, ?How will employment evolve in a technology-dominated economy? ?, is the bedrock of the essay. The following chapters tease out its implications for ?opportunities versus inequality? (Chapter 4), for the education system (Chapter 5), for government (Chapter 6) and ?for what each of us can do? (in the final Chapter 7). If one is expecting a highly original analysis or startling conclusions, one will be disappointed. This is forgivable given the importance of its mission: policy suggestions to mitigate the threat of major workforce displacement through technology disruption. And the long-term policy perspective of the essay is especially important, given the current Australian Federal Government appears to be so focused on its day-to-day survival that it is struggling with the longer-term policies needed to address workforce displacement. The many voices who have alerted us to the potentially drastic impacts of technological change on our society, including President Obama in his 2017 farewell speech, are well summarised in the essay?s literature review sections. Likewise, writers such as Andrew Leigh, Miles Corak, Mendolia & Siminski and others, who have drawn attention to Australia?s increasing structural inequality in personal income and assets. Strangely, Thomas Piketty?s ground-breaking work on global inequity, ?Capital in the Twenty-First Century? (2013), is not mentioned. Perhaps this is because the authors want to focus so heavily on Australia?s predicament ? although they are diligent in drawing on a range of international examples of promising initiatives, where relevant. The authors? analysis is on balance conservative, as they do not put great emphasis on planning for worst-case conclusions. Instead they run rather neutrally with a range of unemployment impact estimates. At the optimistic end, they cite Melanie Arntz et al. (2015) who concluded in 2016 that 9% of current jobs are at risk of automation across the OECD (p.63). At the pessimistic end, they cite Frey & Osborne (2013) who predicted in 2013 that 35% of jobs in the UK will disappear in the next two decades as a result of automation (p. 60). Hugh Durrant-Whyte et al (2016) are quoted as having applied Frey & Osborne?s methodology to Australia in 2015, and concluded that 40% of current jobs would have greater than a 70% chance of being automated within the next 15 years (p.61). I would have thought that prudent risk management would put greater emphasis on planning for these worst-case estimates. The authors are also far too complacent about the merits of Australia?s current welfare system, which they claim is ?the best-targeted means-tested social safety net in the world? (p. 128). To justify this claim they cite a 2014 paper by Prof. Peter Whiteford which demonstrates that Australia leads the OECD in the ratio of government benefits (?transfers?) received by the poorest 20% to the government benefits compared to the transfers to the richest 20% (Whiteford, 2015). ?total social security payments in Australia, at 12 per cent of average household income, are the third-lowest in the OECD [my emphasis]. For the OECD as a whole, the figure is around 22 per cent; for Denmark, Finland and Norway it is between 24 and 32 per cent.? ? OECD Household Income Survey 2014, Table 5. Even the Business Council of Australia has joined with ACOSS ? and the charities that are stretched in supporting the poorest Australians ? in deploring the grossly inadequate level of unemployment benefits. We all know that the current standard measure used by government statisticians to estimate unemployment ? where employment is defined by having a minimum one hour per week of paid work ? greatly underestimates the extent of underemployment, as measured by those earning insufficient money to survive financially, either alone or when supporting dependents. Thus, when the ABS declared on 17 August 2017 that the ?unemployment rate remained steady at 5.6%?, amounting to 730,600 unemployed individuals, we can reasonably estimate ? given the regular publicity on the exploitation of casual workers ? that twice that number of eligible workforce participants, i.e. at least 10%, do not have financially viable employment. In planning for supporting the future workforce, in and out of employment, we should also consider the fate of Australia?s estimated more than 100,000 homeless people, most of whom receive no government welfare benefits whatsoever, since they don?t satisfy Centrelink's eligibility requirement of having a fixed address. When we add to that 10% estimate of the currently unviable unemployed, the possible 35% of jobs to be lost via automation over the next 20 years, using Frey & Osborne?s estimate, we are reaching a possible figure of 45% of future unemployed. The authors reassure us that many will find new types of jobs that currently do not exist, but we would be wise to assume that only 20% will be so lucky. That leaves us with the prospect of 25% real unemployment within twenty years. As mentioned, the book begins with the example of the free learn-a-new-language app Duolingo, as an exciting new business model. The Duolingo example raises the hope of imagining a range of new scenarios for not just online businesses, but also new modes of individual employment ? but these fail to materialise. Once the essay?s literature reviews gain momentum, the book becomes a conventional analysis of the skill sets (largely STEM) needed in order to gain paid work producing, servicing or simply using as support systems, advanced IT innovations in the new Machine Age. Undoubtedly the need to refashion our K12 education system around STEM remains an important policy message. It was championed valiantly during 2014-16 by the then Chief Scientist Prof. Ian Chubb at a time of arguably the most anti-science government in Australia?s history (2013-15). Given that so little of the K12 national curriculum has yet been implemented around STEM, this is a message worth repeating. However Changing Jobs focusses almost entirely on applying the new STEM skills to conventional, paid employment. Given that a clear inference from the book?s literature survey is that the chances of real unemployment in the future Machine Age could reach an irreducible 25% or worse, the essay could have gone further than its aim of ensuring that Australians are well positioned, and equitably so across our demography, to gain full employment within the shrinking number of adequately paid jobs. But what can we do for the rest of the population, likely to be at best seriously underemployed and at worse unemployed for life? ?? the biggest problem is that welfare without work doesn?t guarantee happiness. Work is about more than earning money. It?s about making a meaningful contribution, about teamwork, motivation for education and self-improvement?. (p.130). Yet if we are to be realistic and allow for the contingency that 25% or more of the available workforce could remain more or less permanently outside paid employment ? as was the case for several countries, e.g. Spain and Greece, for years following the Global Financial Crisis of 2008 ? we need an educational system that goes beyond teaching STEM and coding. We need to prepare the next generation for a society in which many worthwhile and satisfying roles, including lifetime learning and volunteering, can be found outside paid employment. Do citizens need to be in paid employment in order to ?make a meaningful contribution, to enjoy teamwork, to be motivated for further education and self-improvement?, to paraphrase the authors? One can observe that many individuals in retirement make valuable contributions in just those ways (and many more), provided they enjoy reasonable health and are supported by adequate superannuation ? or by a much more generous old age pension than is currently available in Australia. Is a comfortable retirement pension not an example of a socially useful, age-range specific, Universal Basic Income? Changing Jobs is far too dismissive of the concept of Universal Basic Income, before the current Finnish experiment has concluded and its results can be properly assessed. UBI is the concept of giving unemployed and underemployed citizens a guaranteed and unconditional monthly subsistence wage for doing nothing ? even if they get a job. (In a more idealised version, every citizen, employed or unemployed, is given the same UBI.) A two-year trial of UBI started in Finland on 1 January 2017, with 2,000 randomly picked unemployed Finns being given a guaranteed monthly income of ?560 (Whigham, 2017). Some of the counter arguments used against the UBI in Changing Jobs remind me of the arguments raised against the original introduction of universal health insurance ? e.g. warning against allocating ?the same amount of government support to a high-level CEO as to a single mum struggling to keep food on the table? (pp. 128-9). The authors quote Dr Chalmers? colleague Dr Andrew Leigh as pointing out that if UBI replaced the current welfare system, it would actually increase inequity. Well of course it would ? if Australia?s Swiss-cheese tax system, which currently enables many of the richest Australians to pay zero income tax as well as laughably minimal company taxes, is not reformed at the same time. A tight and fair tax system would ensure that the UBI allocated to individuals earning medium to high incomes would be recouped by the Tax Office, reducing the UBI?s net cost to government to less than its current welfare bill. And if individuals on say $100,000 p.a., whose UBI might be 51% recouped by the ATO, find themselves sacked without retrenchment benefits, it would be of great benefit to know they would receive the UBI immediately, without a six weeks? wait (as required to obtain current employment benefits). Let alone the indignity and stigmatisation of random drug testing, as proposed by the Turnbull government. Clearly the UBI is not intended to be a panacea for all the weaknesses of a dysfunctional economy. It is merely a simpler safety net which can reduce the indignity of applying for welfare, as well as reducing the overheads in providing unemployment relief. Let us wait for the results of the Finnish experiment to come in. Changing Jobs is well worth reading and discussing, as we have a responsibility towards the next generations to make ourselves well informed on the policy options for remaining a society of relatively high employment. And we surely want to see a majority of those jobs being well-paid and contributing high value; and for there to be social equity in obtaining those jobs. The book has done well in recommending policies that ensure that Australians become as well positioned as any other nation?s citizens to gain employment within the shrinking number of well paid jobs, and to achieve this with reasonable equity across our future adult population. The series of recommendations made by the authors all have merit, and I support them as far as they go. However, my fundamental criticism of Changing Jobs is that it ignores one of the critical inferences from its own literature review: that the chances of real unemployment in the future Machine Age could reach an irreducible 25% or worse ? as was experienced in several First World countries, for several years, after the GFC. What can we do to support a high-quality (if not well paid) life for the rest of the population, with one in four adults likely to be at best seriously underemployed and at worse without conventionally paid employment for life? That should be an essential consideration within any set of policies that aim to provide a Fair Go in the New Machine Age. Frey, C.B; Osborne, M.A. 2013. ?The Future of Employment: How Susceptible are Jobs to Computerisation? ?, University of Oxford, September 17, 2013. Cited in the 2014 Deloitte Insight report: ?The Robots are Coming?, 2014. Whiteford, P. 2014. ?The Budget, Fairness and Class Warfare?, Inside Story, 5 August 2014. GFC = the Global Financial Crisis of 2007-8.